12 Days Gift Give Away – Day 12! Here it is, the 12th and final day of our second Holiday Gift Give Away. We want to thank all of the generous folks who donated the gifts and all of our readers who stuck with us this year, even when we slowed down during our move. The truth is we’ve been holding back on you this year. 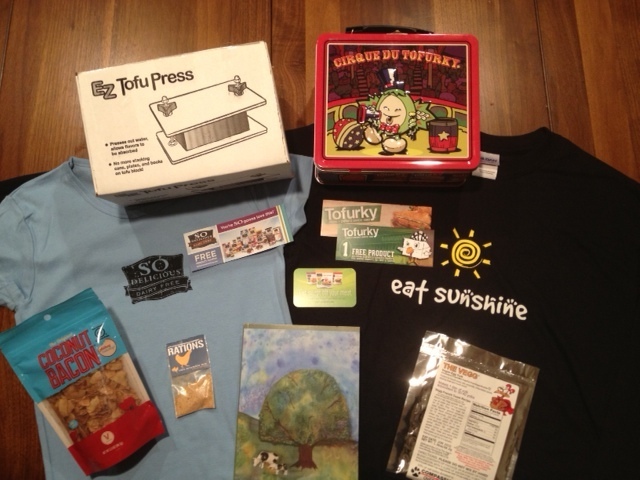 Tofurky & EZ Tofu Press gave us 2 lunch box and presses (respectively), Phoney Baloneys gave 3 bags of Coconut Bacon. You can see where this is going. If you haven’t been chosen to receive a gift this year, here is a second and last chance at getting some of things we’ve given away these past couple of weeks. ….and whatever else we come across the next couple of days! Happy Holidays to all of you and your families. Thank you again for reading and we look forward to sharing all sorts of vegan goodies & news with you in 2014. Let’s be clear this isn’t a ‘contest’. We’re giving away gifts to our friends. However the limit quantities available gifts means we need to make some choices. If you want to receive a gift, please leave a comment on the Don’t Fear the Vegan blog post for that day. Commenting on Facebook doesn’t count. Around midnight Pacific time the day after a post, a recipient will be randomly chosen from the comments section. We will reveal the gift recipients via email and a reply in the comments. The giftee will have 48 hours to contact us from the time of post, otherwise we will choose another lucky reader who then has 48 hours to get back to us, and so on…. We have learned from past give aways that it is sometimes very difficult to get a hold of folks. Lastly we can only afford to ship within the United States. Sorry the rest of the world. 33 Responses to 12 Days Gift Give Away – Day 12! Oh gosh this looks amazing!!! Oh I really love this gift package, especially the tofu press and coconut bacon parts. I hope that I receive this gift it is very special to me. We would love this gift! my wife made me enter, cause I would never ask/enter otherwise. Happy holidays, to you and yours. Fantastic!! Thanks for the opportunity to try all these products!